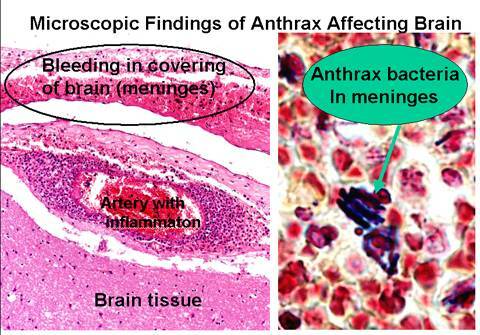 Brain anthrax: Anthrax infection of the central nervous system (the spinal cord and brain) and meninges (the membranes covering the brain and spinal cord. These microscopic findings come from a fatal case of anthrax that occurred in California in 1976. The details of this case have been described in a medical journal called Human Pathology (Volume 9, pages 594-597, September, 1978). The patient, a 32-year-old weaver, contracted the disease from contaminated wool from Pakistan. He had been well until he developed a fever and sore throat 6 days before death. His major difficulties included mental problems such as an inability to carry out simple commands and involuntary eye and limb movements. A spinal tap (removal of some spinal fluid for analysis) revealed bacteria that looked very much like anthrax. All of these findings indicated involvement of the lungsand central nervous system. The bacterial organism was eventually confirmed at the CDC (Centers for Disease Control and Prevention) to be anthrax. For more information about this 1976 case of anthrax and the disease past and present, see Anthrax, Then and Now.